No doubt about it, this is my favorite time of year here in the Northern Hemisphere. We're at the height of our summer temperatures, so it's the perfect time for this beachy post. 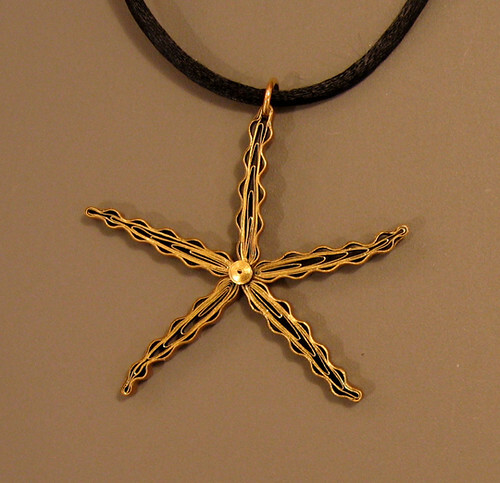 Perhaps you remember the starfish and shell pendants tutorial I wrote for FoldingTrees.com. (March 2016: the quilled starfish tutorial can now be found on this blog as Folding Trees has closed up shop) I thought you might like to see a couple of other sea-themed styles I made for the same order last autumn. 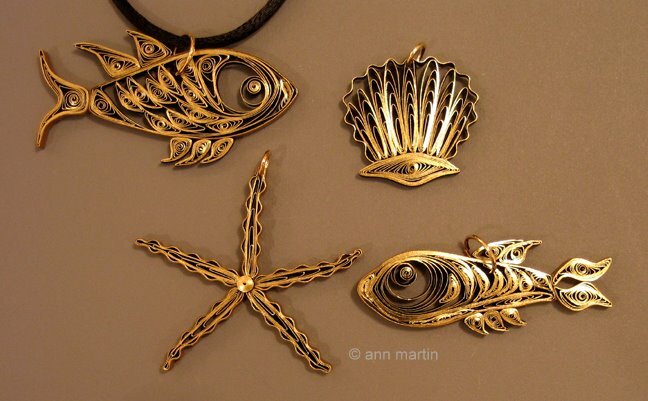 A friend who lives on the coast of Maine had asked me to design them for her to give as gifts and I was delighted to take on the challenge. There's nothing quite like tackling a new project such as this... I'm always excited, and quite honestly a little bit anxious about whether the end result will be what I've envisioned. I begin by googling images of the object and ideas start to flow; soon I'm sketching out a design and then rolling and pinching paper strips. I love seeing the form take shape and even though the finished result often isn't the same as the initial sketch, that's okay! 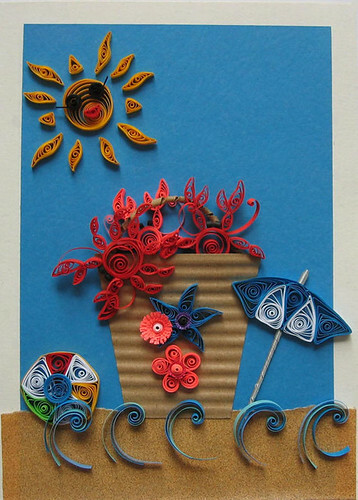 Here's a card project from several years ago that's in keeping with today's sea theme. It's a lot busier than my usual fare, but I enjoyed making it nonetheless. I'd joined a group swap and the challenge was to make something that would identify where I lived. Since my state is bordered in part by the Atlantic Ocean and the Delaware Bay, I decided to quill a beach scene with an oversized sand bucket of Delaware blue crabs front and center. They're oh so delicious at this time of year. Wait... but they're not blue, you say? Just like shrimp, crabs turn a glorious shade of red-orange when steamed, but I bet you knew that. 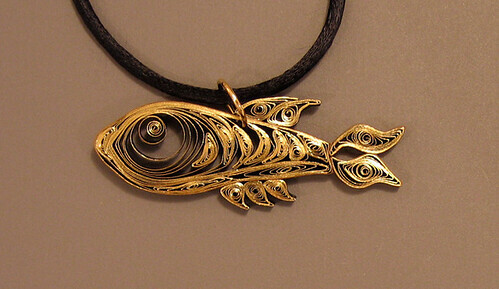 Hmm... perhaps I should quill a gilded crab pendant. I can see it now... the poor crab, hanging by a claw, grabbing onto the necklace for dear life. That fish is gorgeous! Everything you do is outstanding, of course. Thanks for sharing your work! 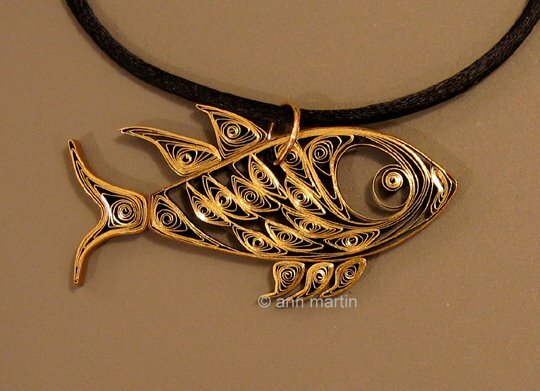 The creative idea of the fish pendant, very beautiful!